Energy activator 100 ml by DAC contains carnitine, vitamins B, C and E, magnesium sulphate, sorbitol and plant extracts. All these elements are indispensable for a good supply of energy. 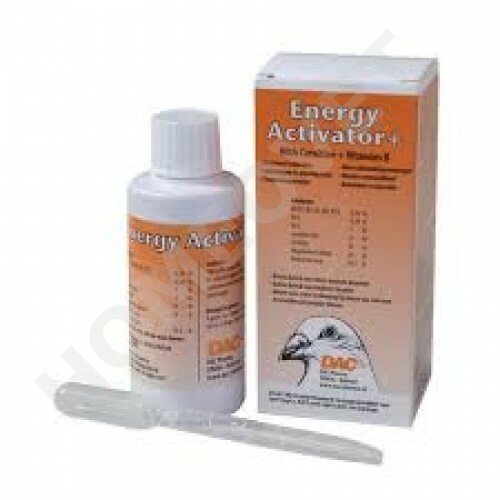 Energy activator 100 ml by DAC promotes and assists in the transport of body fats for more energy. It decreases the content of free fatty acids in the blood, and reduces the amount of lactic acid in the bird's muscles during flying, thereby lowering fatigue and raising stamina. Carnitine releases less CPK (creatine phospo-kinase) in the blood. Lactic acid and CPK are causes of muscle fatigue and cramp. Vitamins B, C and E promote the performance and reinforces the activity of the pigeon. Energy activator 100 ml by DAC is most effective when you administer it with a high fat content or add extra DAC Peanut Oil or Racing Oil to the feed.